How many weeks is it since we started this project? 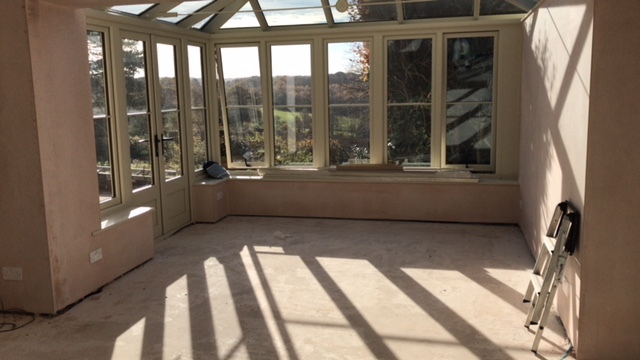 Sometime in September the old conservatory went and a brand new conservatory-end of our old TV room emerged. It has changed the nature of the room, and has given us the wonderful problem of what to call it…TV room is just not descriptive enough, nor is gym room despite the treadmill going back in there when it’s finished. It most definitely is NOT an orangery (Hubby take note) (he won’t, he doesn’t read this…does he know it exists??) Family room, Snug, Den…all good names, but not for this fab space! Of course, MINE springs to mind, teehee, as I shall be in there at almost every chance…the view, the light, THE WARMTH. SO far the underfloor heating is working, and has produced THE warmest room in the house. This just adds to my frustration that we are not further on. The screed seems to be taking a long time to dry out, and now we have a dehumidifier helping it along. I don’t want to get the engineered oak for the floor yet to avoid any warping: it needs to be left in the room for 2 weeks before being laid to allow it to acclimatise. The new little window won’t go in until just before Christmas, so no decorating until that happens…there is enough dust in there anyway. One reason it is all taking so long is apparently we should have rubbed off the white latex layer soon after it solidified…who knew? Not me, no-one told me. The builder, who changed it from dry screed to wet for some unknown reason, has not been seen since it went down ( done by an expert company, not the builders), and I have not heard from him…en email will be going this weekend. As with all building projects there have been niggles. I shall never do this again (hopefully), but if I do it will all be done by local builders I know, rather than using the ones suggested. I shall get professional help locally…oh I could go on, but it’s all academic now. Now I just have to be patient..um, not one of my virtues, as any member of the family will tell you. I will be surprised if its ready for Christmas sadly, nor for The President’s Putter at the beginning of January (it’s a golf competition for anyone who played golf officially for Oxford and Cambridge universities, played in all weathers, with great camaraderie and keen competitiveness). Hopefully it might be ready by the time the Cambridge golf team come to stay at the end of January…PLEASE!!!!!!! I will now concentrate on Christmas…OMG it’s only 3 weeks away…out of my way, I need to panic!